Hello! Today I begin a big catch up of my subscription boxes, starting with July's Mani and Lola box. If you missed my look at June's box, you can find that post here. July's box was intended to help us 'see the Summer through in style', and included five full size polishes and one nail care item. Read on for my full swatches and a look at everything we recieved. 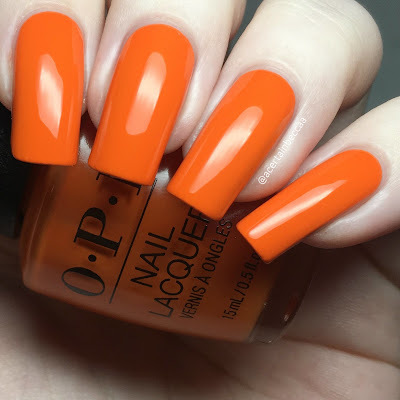 First up for polishes was OPI 'Summer Lovin' Having a Blast! ', a bright orange creme. I did already have this (posted here), so unfortunately it is a dupe for me - but I love it so I'm not too fussed! It has a lovely formula, and a fantastic colour. Below is two coats with topcoat. Next is ORLY 'Hawaiian Punch', a hot shimmery fuschia pink. 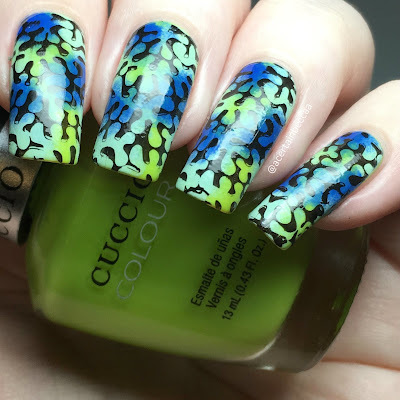 I do have a soft spot for ORLY polishes, so was happy to see this. The formula is smooth and easy to apply. It had good coverage on the first coat, though I did need a second to cover my nail line fully. Below is two coats with topcoat. 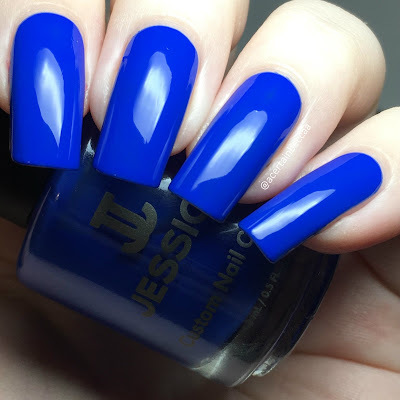 Next is Jessica 'Blue', a super bright cobalt blue creme. It has a smooth, easy to apply formula. It starts off slightly sheer and streaky, but builds up well with a second coat. I had a few minor streaks left so did add a third just to be sure. Below is three coats with topcoat. Next is Morgan Taylor 'Mint Chocolate Chip', a bright mint creme. The formula is smooth and easy to apply. As is common with mint shades, it is on the streaky side. I found I needed three coats to even it out completely. Below is three coats with topcoat. 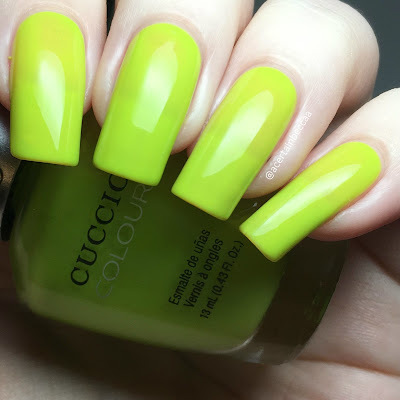 Last up for polishes is Cuccio 'Wow the World', a neon lime green creme. 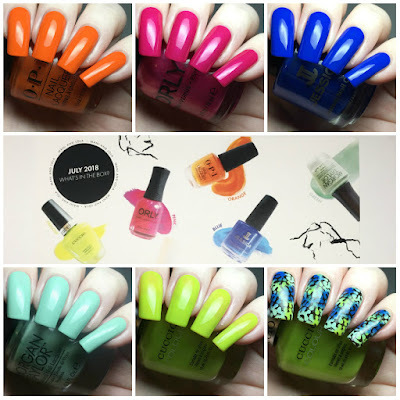 This is smooth and easy to apply, although does have a typical neon formula and is sheer and streaky. It was pretty much full opacity after three coats, but wasn't quite there. I'd definitely recommend a white base. Below is three coats with topcoat. The last item for July's box is a full size colour correcting primer from Essie. I don't tend to have naked nails often (or at all really), so this probably won't get much use from me. I'm sure a lot of other subscribers will though! I couldn't resist a quick bit of nail art. I decided to smoosh the Jessica, Morgan Taylor, and Cuccio polishes together. 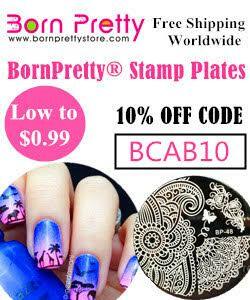 I then stamped over the top in black using UberChic Beauty stamping plate 2-03 and what I believe is a seaweed pattern. I'm not too sure what I was going for but here it is! What do you think? I loved that July's box had more polishes than usual. As much as I love all of the nail care items we recieve, I definitely tend to get more use out of actual polishes. All five polishes are colours I would definitely purchase myself - I love how bright they are! I shall be posting August's box soon, so keep an eye out for that post.